Zucchini is in full swing. If you have a few plants in your garden, you know that it produces heaps and heaps that one family can hardly keep up with. Unfortunately we didn't plant any this year, but we have been picking it up from our local farmer's market. We eat zucchini at least a couple of times a week and I've always got my eyes peeled for a new zucchini recipe. This one happens to be one of my favorites. This recipe comes from Ellie Krieger's The Food You Crave cookbook. 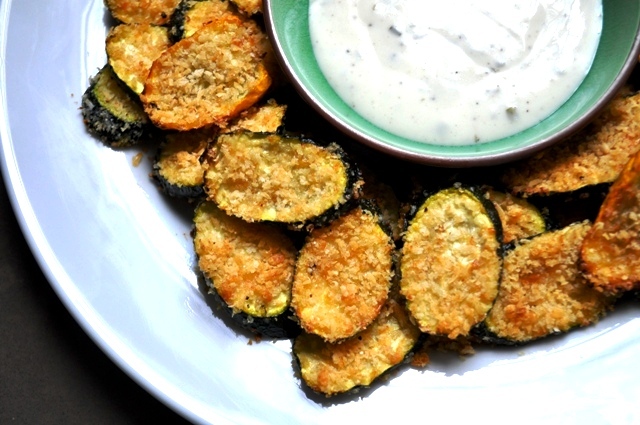 Zucchini rounds (or ovals in this case) are engulfed in a crispy panko and Parmesan cheese coating. 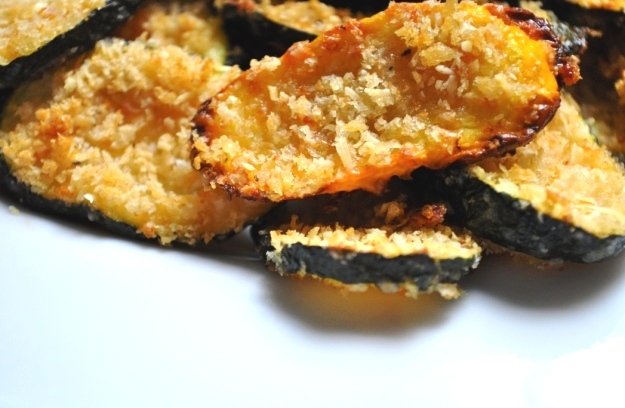 These delicious little chips brown beautifully in the oven with a nice crunch, similar to a crispy fried zucchini stick....but you don't have to feel guilty eating these since they are baked. I like to dip mine in a little (light) ranch dressing which you can easily omit if you are counting calories. They are delicious all on their own. If you've got some zucchini laying around and you can stand to turn on your oven, this is a great way to use some of it up. Preheat oven to 450 degrees. Line a baking sheet with foil and spray with cooking spray. Prepare bread crumb mixture. Place Parmesan cheese, bread crumbs, salt and pepper in a medium bowl and mix. Wash and dry zucchini. Slice into 1/4 inch rounds and place in a medium size bowl. Drizzle zucchini with olive oil and toss to evenly coat all the slices. Coat each slice generously with the bread crumb mixture. Pat crumbs into the slices to get a good even coating. Place each slice on the prepared baking sheet leaving a little bit of room in between each slice. 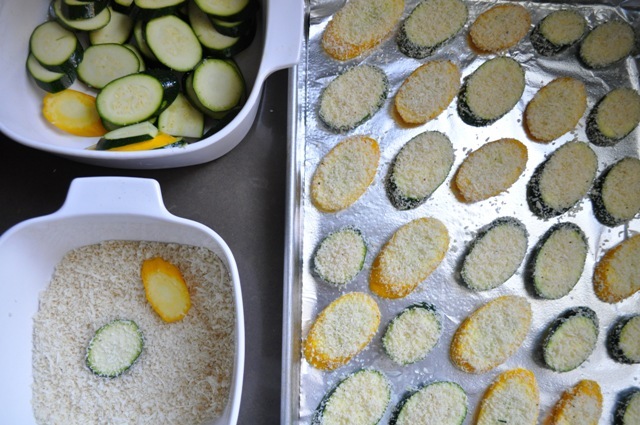 Bake 25 - 30 minutes until zucchini is tender and breadcrumbs are golden brown and crisp. Serve while still warm with ranch dressing. Yummy!! Love that the chips are baked, they look delish.